I like to refer to Friday of SXSW as "heavy as hell day." It was as least as heavy as a tome filled with all the underhanded, corrupt things Mrs. Clinton has done to try to win the primaries. Anywho, the day started out with going to the convention center to see Flatstock and chill with Leia Bell for a second. I looked longingly at some of her tiles and vowed to come back and buy some once I'd found out if my money was going to last or not. We also went to a seminar where the Editor of MoJo interviewed Mick Jones (The Clash, Big Audio Dynamite) and Tony James (Sigue Sigue Sputnik, Generation X) If you have never read an issue of MoJo, you will need to change that. This Bristish based Magazine has been a mainstay on critic's coffee tables worldwide. Mick Jones was incredibly funny and the whole hour went by totally delightfully. The interviewer Phil Alexander from MoJo was really skilled, the way he allowed for their humor to shine but while able to steer the interview in the direction he wanted, dispite their million entertaining tangents. It was pretty incredible how he was able to do that. I barely have any control when I give interviews. Mick and Tony talked about their long history together (over 30 years! ), The Clash, the state of punk today, and how when they started the band they had no idea they would be part of an influential movement called punk. They said they were just doing it to do it, and weren't thinking of long-term influence. They then took questions from the audience, and asked each questioning person their own question in turn. Mick asked questions like, "Have you been to Sedona?" and "Have you seen There Will Be Blood?" Angela and I were starting to get a mild version of the flu and were already drugging up on plenty of EmergenCs, which seemed to help a bit. We were sluggish, no pun intended, and just wandered around trying to hit parties with free food, unsuccessfully. We somehow missed all the free food this year, I swear; the only free barbecue we got was at the Dropcards party. We tried to get into a party that was actually on Saturday, but it was a nice walk to the Mohawk Club. Angela and I went to a party at the Havana Restaurant right behind our hotel and saw The Aggrolites. They had tons of energy and Angela really liked them. I liked them, too, but maybe not as much. Maybe because they kept trying to get the crowd to sing with them and I get really aggro when people try to get me to behave like everyone else in the audience. Seriuosly, whenever a singer starts shouting at everyone to sing or wave their arms around, I go stone silent. But he was a good frontman, very charismatic, and their drummer looked soooo cool and played soooo cool. His eyes were green and he looked like a tiger. We went to this SXSW official party tent right near the convention center thinking surely they'd have some food left, but they didn't. We also hit an Atmosphere listening party on the 18th floor of our hotel, and all they had was beer, lemon bars and lyric sheets for the new record. We pretended to be interested in listening to the CD but weren't all that impressed with the simpleton lyrics and sore of a slide show. ; the beats were just really lacksadaisacal. We admired the view from the 18th floor conference room for awhile and then got ready for our evening. The first REAL show of the evening was Iota at the Small Stone showcase. We got there in plenty of time, for once, and watched Iota getting ready. Their set was so crushing but with tons of bass undermelodies at the same time, with a fresh bluesy appeal. They had plenty of their infamous jamming that grows in intensity; just when you think it can't get any more climactic it ups a notch. The drummer for Sasquatch was a great fill-in for Andy Patterson; more technical, less heavy, and just as good. I thanked him after the show because it's not an easy thing playing a label showcase with a band you've only rehearsed with for like, 35 minutes. Thanks Sasquatch drummer! 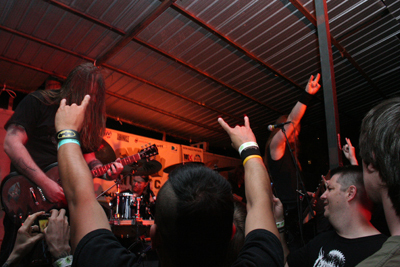 Next came a little bit of 1000 Knives of Fire, also on Small Stone, and they were really good and ... heavy, of course, with raw classic Southern riffage that wasn't afraid of the spaces between the notes, sort of like Bad Company. Next Angela and I booked it to the convention center to see X at the Bat Bar. One of their airplane hangar rooms was converted into a stage that looked like it belonged at the Grammy's or Las Vegas. We couldn't see very well so went out in the hallway, turned the sound on one of the many TVs down so the delay wouldn't bug us, and watched Exene close up and personal, and also watched Billy Zoom's creepy wide-eyed smiley expressions which he directed straight into the camera. Scary! 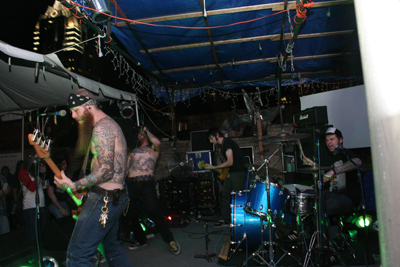 Next we caught a band called Black Tusk, from Savannah, Georgia, on the Blind Pig's rooftop. The view from up there was gorgeous; we could see one of Austin's skyscrapers witih a clock on the side through the tent roof, in the warm night air. 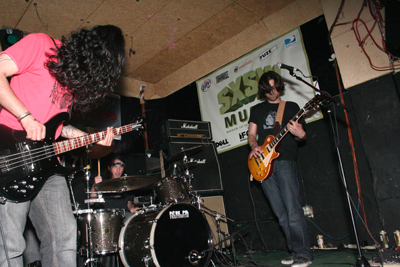 Black Tusk was one of the few bands we saw that was a complete gamble; I'd never heard of them before, just went on their SXSW description alone. I wasn't disappointed; they were so heavy and brutal; like a mess of sound with incredible amounts of anger and torture behind it. There was actually something incredibly disturbing about them, and I don't easily get disturbed. It's almost like the energy I imagine old black metal bands must have channeled. The bassist was covered in homemade tattoos and looked like he would kill you if you looked at him funny. The lead singer had broken his hand so there was a fill-in guitarist, leaving the singer free to thrash around on the stage. He looked like a busted marionette when he careened back and forth, full of pain. He also had better hair than me. Angela and I were hungry by then, even though we'd just had street pizza, we sought out a little Asian tearoom and had miso soup and shared sushi with dyed purple rice. We tried to get into the Dalek showcase, to no avail, and instead caught the tail end of a boring minimal indie band that I think was called Kayo Dot. We rushed over to Blue Cheer, and caught about two songs with Joey from Iota, who is a big Blue Cheer fan. It was pretty awesome seeing one of the original stoner bands from the 60s who had such a big influence on that whole movement. There was something very primal and powerful about them, and also, they were loud as hell. I'm telling you, you can always tell those bands that came straight from the source; the ones that sup from streams of sonic light that only they can see and only they can hear, and bring a new dream to a mediocre land. Angela and I hurried to get into Enslaved, because I knew there might be some trouble getting in. It was; it was the first venue we had to wait more than five minutes to get in and if was iffy we were going to get in at all. And then the only reason we got in was the door guy who was guarding the door went to go get someone and I guess his fill-in didn't know it was sold out, so he let us in. Ha! Enslaved were amazing, even though the volume of the speakers weren't loud enough. The members were all very beautiful and very Norwegian and very hypnotic. One of their last songs is my favorite song, "As Fire Swept Clean the Earth" from Below the Lights, and it's as epic as the title sounds. it's one of the most heartbreaking tracks in all of metal. It's also one of their "prettiest" tracks so I don't know if many of their fans love it. I hope they play that song at my funeral. Next I went to Room 710 to catch the last bit of Sasquatch with the Iota boys once again. Sasquatch was also deliciously heavy and raw, and it was cool to see the drummer playing in two different bands; how he adapted to the sound of both. After Sasquatch I was really worn out from my "heavy as hell" day and went home and went to bed. But before I went to bed I saw a racoon and turtles swimming in the canal by our hotel.